Maddy Smith is an almost normal teen living with her parents in a small rural town. The "almost" is because she's a Wolfblood! Neither completely wolves nor humans, Wolfbloods have great powers - super speed, strength and senses - and can change from one form to another. Just as Maddy's getting ready for her first transformation, a new boy, Rhydian, starts at her school - and they both instinctively know their true nature. 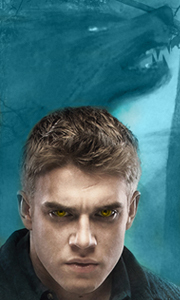 Rhydian helps..
Own WolfBlood Season 2 DVD from Deff, DVD, Blu-Ray & 4K Video Specialists - Free UK Delivery..
Own WolfBlood Season 3 DVD from Deff, DVD, Blu-Ray & 4K Video Specialists - Free UK Delivery..
Own Wolfblood Season 4 DVD from Deff, DVD, Blu-Ray & 4K Video Specialists - Free UK Delivery..
Own Wolfblood Season 5 DVD from Deff, DVD, Blu-Ray & 4K Video Specialists - Free UK Delivery..
Own WolfBlood Series 1 to 5 DVD from Deff, DVD, Blu-Ray & 4K Video Specialists - Free UK Delivery..